In an effort to encourage and reward upstanding behavior, staff members from Prieto Math & Science Academy put together a carnival of epic proportions for their students. 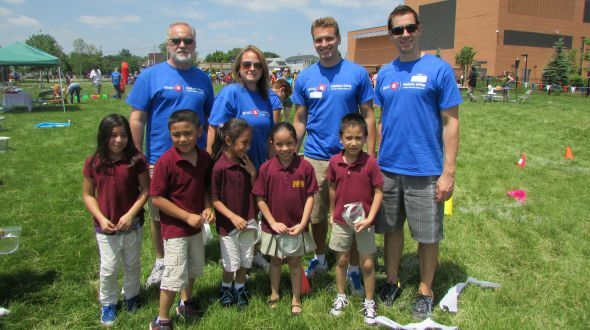 With the help of Urban Initiatives Program Associates and a group of volunteers from BMO Harris Bank, the school set up a number of fun and interactive booths on their green space. The staff put on an unparalleled event complete with a dunk tank, giant basketball jumpshot game, musical chairs, face painting and so much more! Urban Initiatives Program Associates brought on their expertise and set up a soccer game, a recess station and a concession stand that gave out fruit, granola bars and water. At this point, volunteers from BMO rolled into the parking lot and enthusiastically jumped off the bus. Spreading out into teams for every booth, the volunteers took charge of their tasks with excitement. The students then rushed the field by their grades and quickly hit up every booth, trying to win as many tickets as they possibly could. They carried with them tickets they had earned throughout the year for their good behavior and they were looking to redeem them for activities, food and fun! Our BMO volunteers had no problems reciprocating the kids’ excitement and were quick to engage with them. Volunteers at the recess station spread throughout the carnival inviting groups of students to come out and participate. Others took on creative ways to push the students to grab some water and fruit. “This is earth’s natural soda!” was their marketing hook and it definitely worked under the heat of the morning sun. Sam Goodstein, who is the PBIS internal coach and Special Education teacher commented that “it was great to see all the smiles on the kids’ faces and see how teamwork put this amazing event on!” Once each grade had spent about an hour on the field visiting as many booths as possible, they concluded by redeeming their earned tickets in the gym for books, toys and other fun items. In this way every grade level got a chance to enjoy some time in the sun and celebrate the end of the school year. You can see pictures from this great event HERE. Urban Initiatives and the Prieto school staff would like to thank Ron Redd, Kemmons Feldman and the entire BMO Harris staff for volunteering their afternoon with our kids!